Every car owner knows that owning a car involves lots of recurring expenses. This is especially true as inevitably a part fails and you have no alternative other than replace it. One good example of this is the serpentine belt. It is a very important part of your car’s engine and must be carefully maintained for your vehicle to function properly. Older cars had a multi belt system that has been replaced by serpentine belts in modern cars. The serpentine belt is an essential part that plays a major role in the performance of other engine components like the air compressor and power steering pump. If the serpentine belt gets damaged it can cause dysfunction among many peripheral devices, impacting the overall performance of the car. Since a serpentine belt replacement doesn’t cost very much, it shouldn’t be too big of a worry to car owners. That is if it is replaced correctly and at appropriate intervals. When is Serpentine Belt Replacement Necessary? The longevity of your car’s serpentine belt depends on many factors, the primary ones being heat, tension, load, and mileage. Sometimes when the belt is passed around a pulley, it gets bent and flexed, generating excessive heat which cause the rubber to harden. If the belt is allowed to slip continuously after that, it accelerates belt wear which negatively affects the belt life. It is therefore important to establish proper tension in the belt during installation. 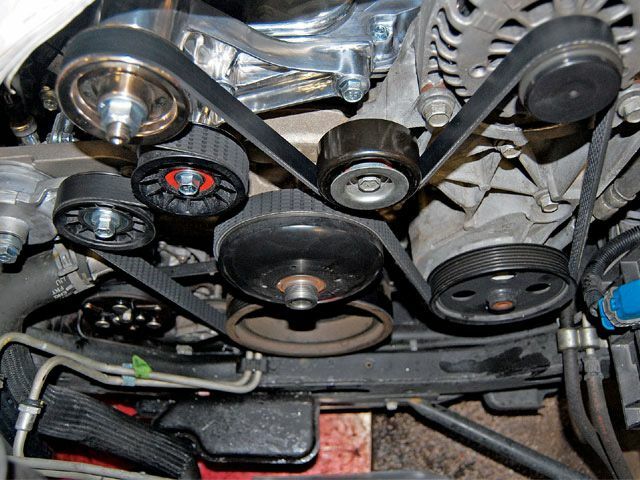 There are several things that might signal a serpentine belt replacement is required. You need to recognize them and take action immediately to make sure that your car doesn’t stop functioning altogether. Usually if your car’s fan, steering pump, or A/C compressor make a squeal every time you turn them on, or if battery keeps running out frequently, it is an indication that your car requires a serpentine belt replacement. Apart from these signs, any loosening or noticeable cracking around the V-belt might also suggest an immediate serpentine belt replacement is called for. Even if you do not see any of these things happening in your car, it is advisable to replace your serpentine belt at regular intervals as a preventive maintenance measure. Since belts usually pick the worst possible time to stop functioning, a periodic replacement might save you from lots of unnecessary trouble. Typically automobile experts advise a serpentine belt replacement or even a serpentine belt tensioner replacement once every three or four years, or after every 36,000 to 48,000 miles. This helps guard against unexpected belt failure which can leave you stranded and severely damage other engine components. When replacing your serpentine belt make sure that the new belt is the same size and width as the old one. This is because a slight alteration in the size might create tension adjustment problems later. We recommend that you first study the old serpentine belt’s routing before installing a new one. In case it isn’t available, there is usually a belt-routing placard right below the car’s hood. This typically contains serpentine belt replacement instructions along with a serpentine belt replacement diagram which shows exactly how to route the belt. After the installation is complete, you then need to use a belt gauge to create the correct tension as per the factory specifications. Once the tension has been adjusted, the driver needs to recheck it again after the car has traveled a few miles. Despite your best efforts there might be a problem with the installation, potentially damaging the car further. In such cases you should not drive it for long and should call a professional mechanic to come to your rescue. All of the warning signs mentioned earlier in the article can also occur from incorrect installation. There are many automobile repair and servicing centers which offer car owners help with serpentine belt replacement, usually for modest service charges. If you aren’t sure about the condition of your car’s serpentine belt it is best to consult a mechanic. They would definitely be able to tell you if your belt really needs a replacing and if so they can quickly assist you with the replacement. National Oil Change Chains like Jiffy Lube and Express Lube are just a couple of examples of where you can find serpentine belt replacement services. There is no reason to neglect the problem and let it grow given there is such an easy, inexpensive fix. Take your car in for routine belt checks and solve the problem as soon as you can and enjoy a hassle-free ride.